Continuing my calvalcade of fall photos from the Eastern Sierra. 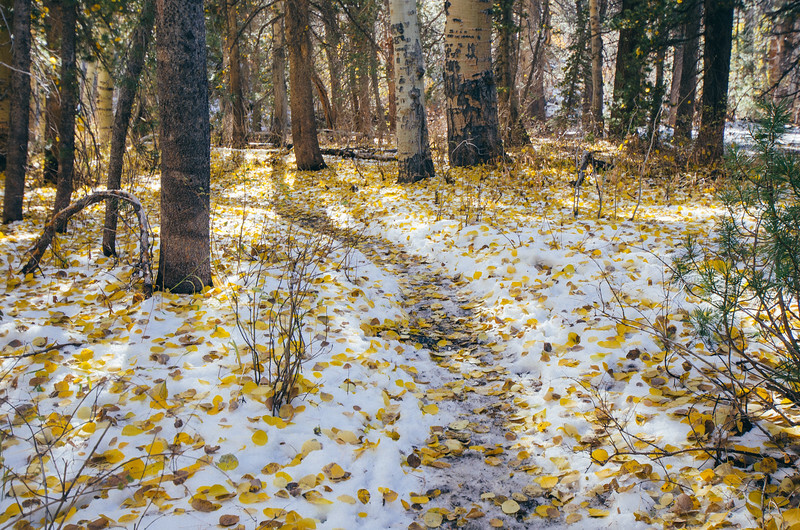 This one was taken in an aspen grove in Lundy Canyon that was holding just enough snow to really make the colors pop. (Lundy Canyon is 40 miles north of Mammoth Lakes, btw). I didn't think much of the photo at the time I took it -- it was just sort of an obvious photo to snap as I walked up the trail. I was more enamored with some closeups of leaves-in-the-snow. As it turns out, those shots are kind of boring and this one is a nice scene setter with a nice dash of color. Camera & Settings: Nikon D5100, Nikon DX 10-24mm lens at 24mm, ISO 100, f/5.6, 1/80th shutter speed, shot in RAW and processed in Lightroom. Note: I didn't expose this terribly well; I should have stopped down to ensure more depth of field. I got lucky and it turned out, but not ideal settings. If you're interested in a print, they're for sale on my SmugMug site. They're affordable (prices start at $10) and available in 8 x 12, 12 x 18 and 16 x 24. Click here for more details. I like the metallic prints, which really add some pop to the colors.